Eddie Flynn, Steve Cavanagh’s conman turned lawyer, burst onto the legal thriller scene in the stunning 2015 debut The Defence (reviewed here). That book was a Hustle meets Die Hard meets The Practice thrill ride involving the Russian Mafia, an unwinnable court case and, literally, a ticking bomb. 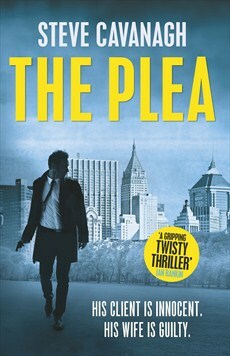 Flynn returns in a sequel which is, if anything, more convoluted, more suspenseful and, importantly, just as much fun. The setup for The Plea is anything but simple. Suffice to say it involves, in no particular order: the CIA, the FBI, a crooked money-laundering law firm, blackmail, drug cartels, an internet billionaire, a publicity seeking District Attorney and, if that was not quite enough, another seemingly unwinnable court case involving a classic locked room murder mystery. As with The Defence, the clock is ticking and Flynn has skin in the game, in this case the potential of his wife going to jail if he fails. The Plea opens with a teaser involving guns and bodies and then flashes back to forty eight hours before to chart how Flynn got there. Various chapter headings then remind the reader how close they are getting to that opening shooting. Eddie Flynn is, as previously, the best thing about this book. The hustler turned lawyer, staunch defender of the innocent, who can read people and second guess their dastardly schemes. As his problems pile up, Eddie is often able to stay one step ahead of the opposition, even when he is not sure who the opposition is or what their motivations are. But he rarely seems to catch a break and it is often two steps forward one step back – every time it seems like he is making headway, Cavanagh’s landmine laden plot springs another surprise at him. When Flynn pauses for breath it is only to formulate another legal strategy while also trying to solve the mystery of the murder that his client has been charged with. Also enjoyable is the supporting cast. This includes the reprobates who are willing to help him out, such as Popo the snitch and a tough guy called the Lizard who keeps komodo dragons and speaks about himself in third person. But also, David Child, the Mark Zuckerberg-type billionaire who possibly unwittingly helped a crooked lawfirm set up a sohisticated money laundering scheme and now also stands accused of his girlfriend’s brutal murder. Once again, Cavanagh has managed to combine the tension of a series of 24 with the legal manoeuvrings and questionable lawyers out of a John Grisham novel and the suave con-artist styling of Ocean’s Eleven. And it is a combination that absolutely works. Experienced crime readers will pick a few of the twists but this is overall a smart, page turning, legal thriller with the emphasis on the thriller. And the fun is not in working it out but, given the narrator is a con man, in seeing just how it was all done and he manages to unravel it on the fly.